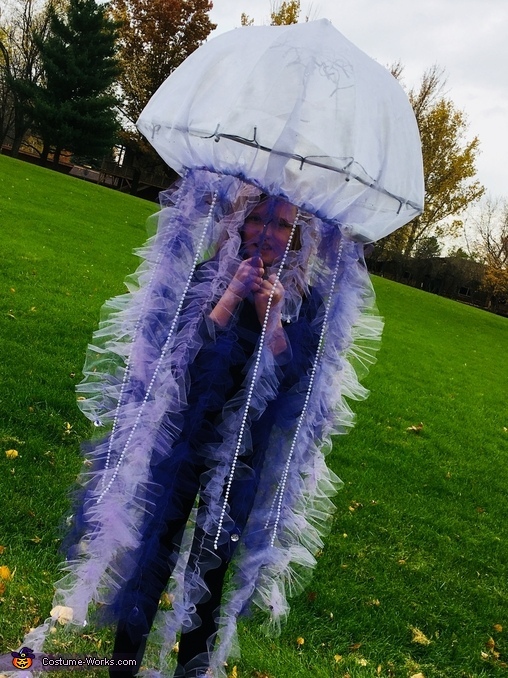 My daughter, Tava, came up with the idea of being a jellyfish for Halloween. When going to the zoo one of the first stops we make is the aquarium, which has an entire room dedicated to many different species of jellyfish. This costume seemed very appropriate for my 10 year old daughter. Materials used: a clear bubble umbrella, sheer purple fabric, light purple and dark purple tulle, white pearl necklaces, white battery-powered lights, elastic, thread, sewing machine. My mother-in-law, Regina, is an amazing seamstress. She measured, cut, and sewed the fabric that covered the bubble umbrella that created the head/body of the jellyfish. She inserted elastic in the fabric as well so the fabric can easily go on and come off the umbrella. That way we didn't damage the umbrella and Tava could use the umbrella for its intended use after Halloween was over. My daughter sewed the tulle down the middle so that it slightly bunched together, creating the tentacles of the jellyfish. The tentacles were then sewed on to the head/body of the jellyfish. The pearl necklaces were cut and also sewed on to the head/body of the jellyfish. The battery-powered lights were weaved around inside the umbrella to create a nice effect. She wore all black clothing while wearing her costume to create a contrast. Otherwise, if she would have worn the same colors, you would not have been able to see the tentacles as nicely. The cost of the costume was around $50. The costume took approximately 5 hours to make. Tava had multiple people come up to her and ask if they could take her picture. Everyone absolutely loved her costume. People were really impressed when they were told that she made a lot of the costume on her own.